Pool cleaning is one of the services that we provide to pool owners throughout Phoenix, Scottsdale, Glendale, Gilbert and the surrounding cities. If you have cloudy water, bugs, or yellow, green, or black algae plaguing your swimming pool, we can be of service to you. We also provide services to maintain and repair any problems you have with your pool. If you’re looking for a professional swimming pool cleaning service, contact us today. We have professional and skilled technicians that will work hard to make sure your pool keeps looking great. 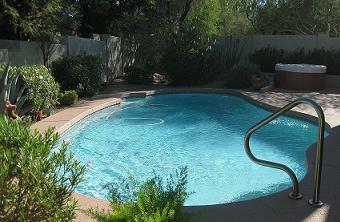 Dan's Pool Catering, the swimming pool cleaning and maintenance company in Phoenix. There are multiple components to pool cleaning. Keeping the pool’s chemistry balanced is an important part of keeping your pool clean and healthy. Alkalinity, calcium hardness, pH levels, and many other types of chemicals and treatments can be added to your pool to keep it in good shape. In addition to the chemicals in your pool, there are other steps to a clean pool. A skimming net is a tool that every swimming pool owner should have for in between pool cleanings. This net helps to get any leaves, bugs, or other debris off the surface of the pool. A pool suction cleaner or vacuum cleans any dirt, sand, or debris off of the bottom of your pool. Automated pool cleaners just crawl all over the pool, sucking in everything that shouldn’t be there. Brushing the walls of your pool keeps algae from forming. This is in addition to maintaining the chemistry of your pool; brushing the tiles is a good habit to keep the algae and debris away. Cleaning pumps and/or filters is also necessary to keep your pool in working order. Depending on the type of filter you have, it can be dangerous for those who don’t know what they’re doing. That’s one of the areas where we can help. Pool cleaning takes quite a bit of time and equipment to do the job right. We have the skills and the tools to be able to complete pool cleaning jobs on a regular basis. If you notice that your pool is looking a little cloudy, has a strange odor, or has any other visible difference, and you live in Mesa, Tempe, Cave Creek or any other nearby city, please give us a call. If you’ve recently purchased a pool (or a home with a pool), you might not have realized all the work that goes into keeping it safe and looking beautiful. Busy families tend to neglect their swimming pools from time to time, sometimes to the point where they can’t use them for entertaining guests or going for a random swim whenever they want. We help these busy families keep up with the maintenance of their pool, so they can use the pool at their own discretion. We also come out and do a pool cleaning, if your pool has been closed and you want to open it again. There are some things you can do to keep the pool in good shape in between our cleanings. If you have a problem with dust and leaves getting into your pool, you might want to buy a cover to keep the debris out. If you have a problem with bugs, you can buy a spray for the perimeter of your yard to deter bugs. Having a set of pool testing strips will let you know when the pH or alkalinity is not right. Testing your pool out occasionally before you go for a swim might be a good idea. Our swimming pool cleaning service is available on a scheduled basis to all of our customers. We will come out and make sure your pool is properly maintained, free of debris and chemically balanced. We take the time to make sure your pool is as perfect as can be, so that you can take the time to relax and enjoy your pool. 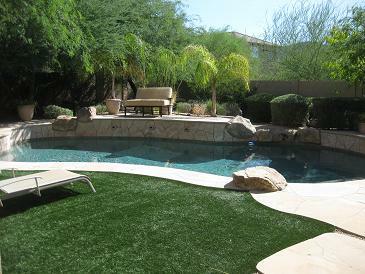 We provide pool cleaning in Phoenix, Arizona as well as Cave Creek, Carefree, Scottsdale, Glendale, Peoria, Mesa, Chandler, Gilbert or any of the nearby cities.